Frank Guidry’s luck has finally run out. A loyal street lieutenant to New Orleans’ mob boss Carlos Marcello, Guidry has learned that everybody is expendable. But now it’s his turn—he knows too much about the crime of the century: the assassination of President John F. Kennedy. Guidry knows that the first rule of running is "don’t stop," but when he sees a beautiful housewife on the side of the road with a broken-down car, two little daughters and a dog in the back seat, he sees the perfect disguise to cover his tracks from the hit men on his tail. When I was growing up I often heard that people in my parents' generation could vividly remember where they were and how they felt when they heard President John F Kennedy had been shot on a sunny day in Dallas, Texas on Friday 22 November 1963. Even though JFK wasn't the leader of our country, and it happened half a world away at a time when there wasn't the 24-hour news cycle and social media barraging us with oh-so-much oh-so-instantly, it was news that cut across the world quickly, shocking everyone and leaving a lingering impact. (I guess for my generation, perhaps the equivalent is the Twin Towers falling on September 11th, 2001). JFK's assassination ended a presidency and stunned the world. In this exceptional novel from Edgar Award-winning author Lou Berney, it could also spell the end for a New Orleans mob lieutenant. Frank Guidry is a street lieutenant for Kennedy-hating mob boss Carlos Marcello. A fortnight before JFK was shot he ran a seemingly innocuous errand in Dallas. Perhaps not so innocuous in hindsight. Now Marcello seems to be cleaning house, and Frank ends up on the run with some killers on his tail. Scarpering towards Las Vegas in the hopes of a long-shot at his life, Frank meets stranded housewife Charlotte, who is also on the run. With her kids in tow. This offers Frank a convenient cover as a family man on the road best, while also proving problematic in unexpected ways. It also allows Berney to intercut between Frank and Charlotte's perspective (as well as that of a trailing hitman) as the unlikely pair try to escape their pasts and grasp towards a rather shaky future. Put simply, this is an exquisite tale that moves like a freight train while never short-changing character depth or rich historical texture. Berney draws us in beautifully to the lives of Frank, Charlotte, and other characters. NOVEMBER ROAD rolls along on sublime prose. The JFK assassination is a fascinating backdrop and the feelings of the times are wonderfully evoked, while never overwhelming the focus on the two main characters and their relationships. Berney beautifully balances the personal and the broad. 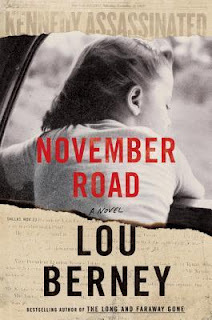 NOVEMBER ROAD somehow manages to feel both intimate and a little bit epic, all at once. Overall it's a wonderful read, multi-faceted crime that pulses with humanity, authenticity, and perhaps redemption.